Okay, I figure that someone has to report on this, so it might as well be me. The fact is the Roku might be the best thing to happen to television since television. So what is the Roku? Well, he was the Avatar before Aang, but that’s another story. 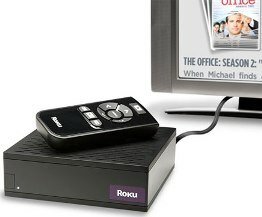 The Roku is a set-top box that works with the popular online rental company Netflix to give a user access to over 10,000 movies. No discs are required for this guy, and there is no hard drive happening here either. None of those features are needed, since all you need to do is select the video, and it streams without waiting. Why, the Roku is like a YouTube for movies! I’m not really certain how this contraption works, but I think it can be assumed that an internet connection to the television is involved. The Roku is designed to work with any type of television set with RCA jacks, S-video, component video, HDMI, and optical audio. Right now, the little Roku box will sell at about $99, but the user will have to pay Netflix $9 a month for a subscription fee. The current choice of movies are some oldies but goodies, but new flicks are being added daily. No more going to the video store anymore, and it’s about time.